In the remote northern corner of Alaska lies the Arctic National Wildlife Refuge. Much of the year, this is a very cold and harsh place, but in summer, it bursts forth as an unparalleled wonder of God's creation. The Refuge's flat coastal plain, flanked by verdant hills and snowcapped mountains, transforms into an amazing cradle of life that is unlike any other place on earth. Birds from all 50 states and every corner of the globe fly thousands of miles to the Arctic Refuge each summer to nest and raise their young. Imagine a place so special that birds fly here, not only from your backyard, but also from the far corners of Africa, New Zealand and Antarctica. It is not just the birds, but other animals too. The 197,000-member Porcupine Caribou herd migrates hundreds of miles annually to their Refuge birthing grounds. Polar bears rely on the Refuge for denning, and other species—including wolves, grizzly bears, foxes, moose and muskoxen—make the Refuge their home. Still, despite its critical role in the web of life we all depend on, this incredible piece of God's handiwork is under threat by Alaska lawmakers and the Trump Administration who want to remove its historic protections and turn it into an industrial oil field. Discerning God's will on questions of preservation versus development is rarely easy. Humankind requires a balance of both, and people of equal good intent can disagree on the specifics. Some places, however, like this incredible wildlife refuge, play such a vital and unique function in creation that subordinating their God-given role to human whim and fancy would be nothing short of impious. President Reagan referred to earth as "this magical planet that God gave us." Magical indeed. How else would you describe a 6-inch bird, the Northern Wheatear, flying 13,000 miles from Africa each spring to nest on the Arctic Refuge coastal plain—and then back again? This tiny bird, along with more than 200 other bird species, could theoretically fly to any other spot on the planet, but it does not. God has hardwired it to travel to this one place—the Arctic Refuge. What happens if this nesting ground, provided by providence, is suddenly lost to oil development? In the Book of Matthew, Jesus reminds us that God provides for all the "birds of the air," and that He knows every one of them that falls. The Bible is also clear about our duty, both individually and collectively, to be good stewards of God's creation. Fulfilling that enormous responsibility requires going beyond short-term parochial considerations and looking at the big picture. It requires thoughtful attention to His design. Perhaps that kind of humility, reverence and commitment to stewardship played a role in Republican President Dwight Eisenhower first protecting the Arctic Refuge in 1960. He saw the need to balance oil development at Prudhoe Bay with the protection of critical wildlife habitat. Today, too many politicians have chosen to ignore the Refuge's God-given role in sustaining life on earth. Some leaders in Alaska have unwisely gambled its fiscal health almost entirely on oil revenue, and are grasping for anything that might offset a decline in oil production from the Prudhoe Bay oil field. They have made opening the Refuge for oil drilling a top priority. The Trump Administration seems more than happy to go along, and has language designed to accomplish that goal in its budget request to Congress. 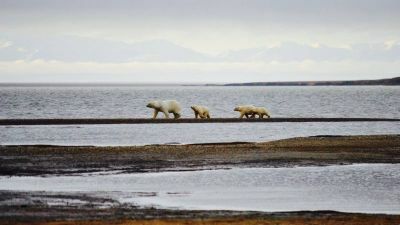 In addition to being blind to its designed purpose and ecological value, those seeking to develop the Arctic Refuge seem equally blind to market realities. Abundant supplies of cheaper-to-produce oil, much of which is now extracted here in the U.S., would render any oil found in the Refuge unprofitable. The CEO of oil giant Royal Dutch Shell recently told shareholders that he expects the price of oil to be low—far below the break-even margin for developing arctic oil—"forever." Even if Trump and Alaskan politicians manage to strip the Refuge of its protections and prod a company to drill there, any oil found would not even supply our nation. Every drop would be shipped off to China and other Asian markets. The Arctic National Wildlife Refuge is a true wonder of creation, a cradle of life—handcrafted by our Heavenly Father—that creatures from all over the globe depend on for their very existence. Who can doubt that the incredibly long wildlife migrations to this place are part of God's design, and reflect His will? It must then be our duty as Christians—and as humans charged with the care of creation—to save the Refuge from those who wantonly seek to destroy it. By doing so, we honor His design, and like Noah, courageously protect the life He has placed in our care. David Jenkins is the president of Conservatives for Responsible Stewardship, a national nonprofit organization.